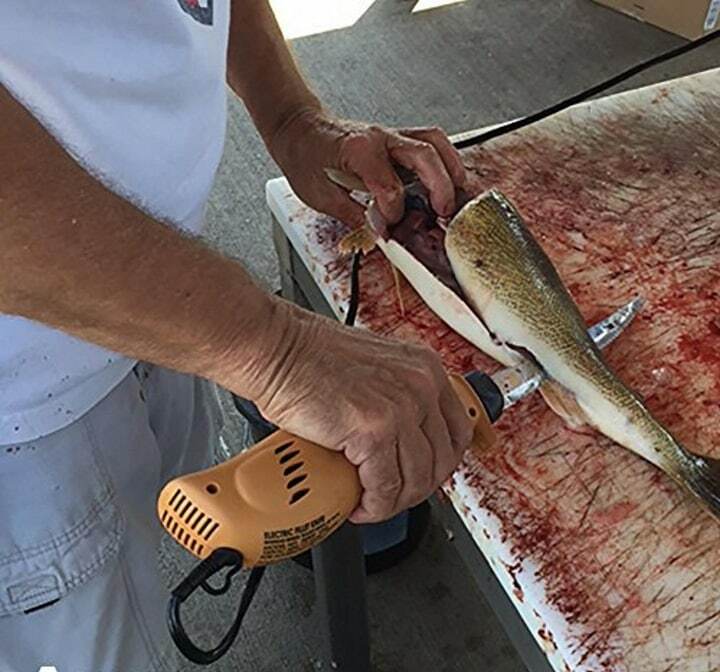 A good day on the water can turn into a total mess when that fillet knife you’re using is a dull as butter knife. In general. I carry at last three fillet knives on my boat at all times; even decent quality blades have a lifeline on the cutting board, but a knife with poor steel can run out of steam in very short order. People often run from the fish-cleaning job because, in some cases, they have been introduced to the task by way of some darn poor equipment. Give anyone a dull knife to be used on any cutting task, and the outcome is never a positive experience. Here are, to my way of thinking, some good quality fish-cleaning knives that won't leave you stranded with a badly butchered piece of meat for the dinner table. Almost as old as American sport fishing, the Rapala fillet knives have been a standard to work by for almost as long as I can remember. I say “ almost” because the forerunner to the “Rap” was the Nor-Mark fish fillet knife and I have owned the same one since 1973 and cleaned far more fish then I could ever count. I believe the Rapala knife design came off the Nor-Mark knife back prior to the “Rap” being turned out for commercial sale. The secret behind a good fillet knife is all in the blade steel. The Rapala uses a grade of steel that can hold an edge for a long time and this is critical when you’re confronted with several limits of sunfish, crappie, or other mass panfish-related catches. There was a time when I had my fishing camp in west central Minnesota, the home of 10,000 lakes, that we fillet-cleaned and boned-out as many as 200 fish a day. Try that with a dull knife and see what happens. In later years, the Rapala was always in use around our fishing camp. The Rapala knife listed here retains a full tang 7-inch Swedish stainless-steel blade with a classic birchwood varnished handle. 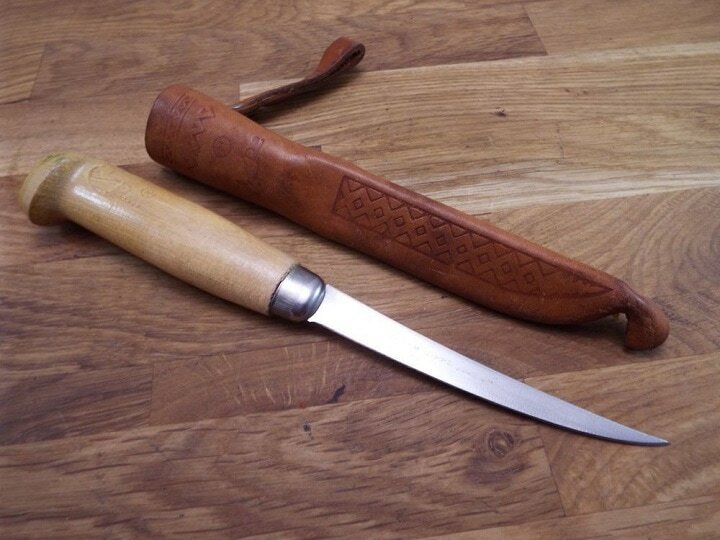 A leather sheath and single-stage sharpener complete the fillet knife package. The price of Rapala BRK varies, so check the latest price at Amazon. 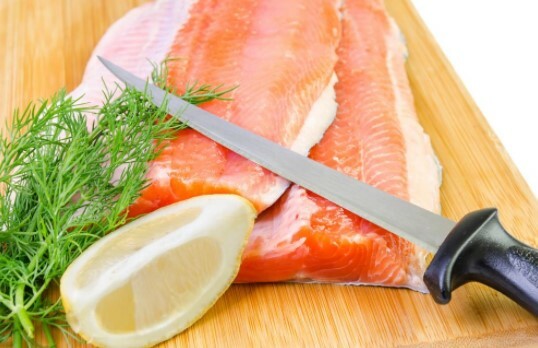 This stainless-steel fillet knife retains a 6.1-inch blade of stainless steel. The grip surface will not absorb odors, and it is easy to grip. The ends of the grip handle retain what is almost a replacement for the old school Nor-Mark brass anchors re the blade and the handle. Made with Sandvik 12C27 stainless steel, the knife will stay sharp longer and fight off corrosion. Blade thickness 0.07 inches, total knife length is 10.6 inches. Plastic sheath is an easy clean material, and the complete package comes with belt loops and clips. 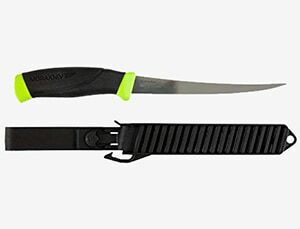 The price of Morakniv fillet Knife varies, so check the latest price at Amazon. The Kershaw 9-inch fixed blade fish fillet knife is made of 420J2 stainless steel. 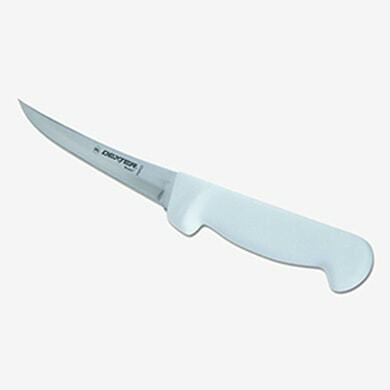 Th knife makes use of soft-textured polymer grips and is a good knife for filleting larger fish. 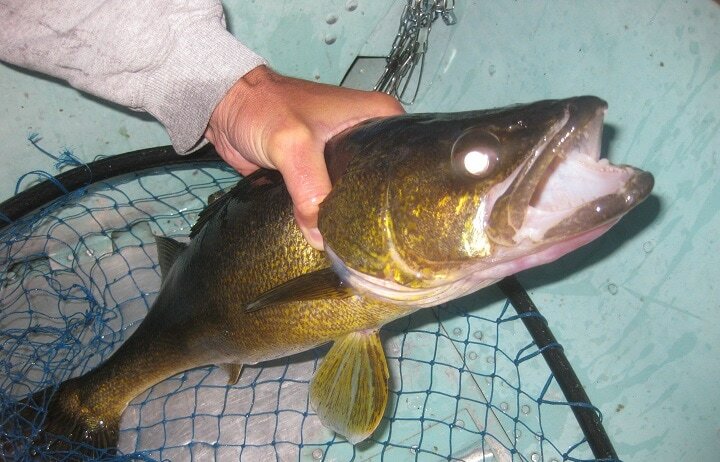 This thick body walleye pike takes on a real knife when it is time to cut and pack. Most of the knives I own are not lookers, but are get-it-done tools. If the blade can't cut, it is useless to an outdoors man. The price of Kershaw Clearwater Knife varies, so check the latest price at Amazon. Gerber is a product of well-known quality. 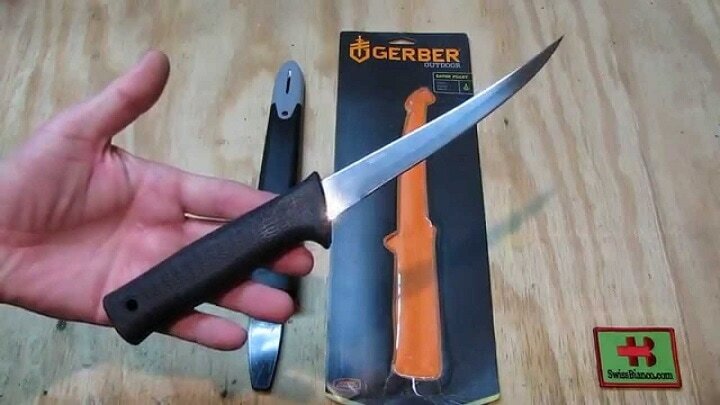 If it is a Gerber, it works. 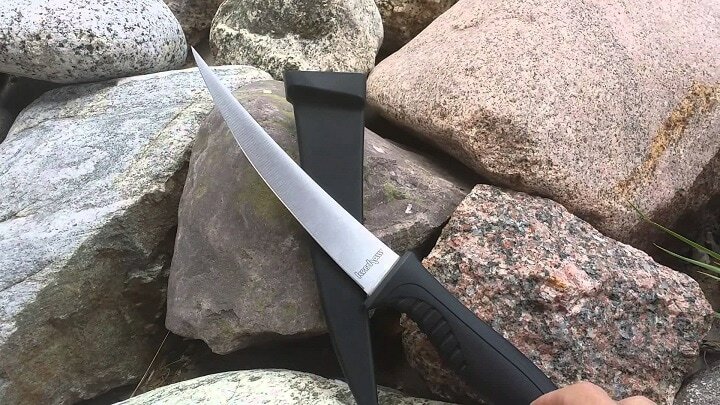 This knife is a 6-inch fillet knife that is general purpose and not so so long that it can't be tucked away in a tackle box or under a boat seat when on the water. 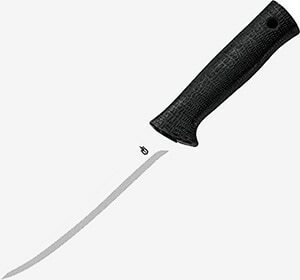 This very affordable knife retains the basic blade design of a commercial fish knife, and because I buy some of my field tools from a restaurant service company here in my home town, I do know the difference. This is a work knife with little glitz or glamour, but hard-working guts are built into its blade and handle. The price of Gerber Gator Knife varies, so check the latest price at Amazon. 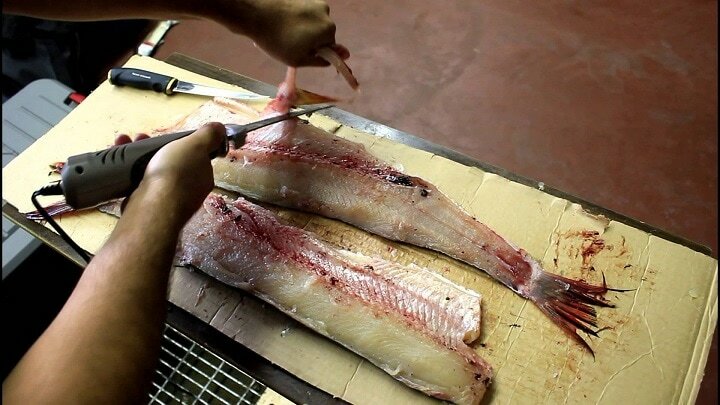 You may ask what a boning knife is doing with fish fillet knives? It is because these blades are in the same family. 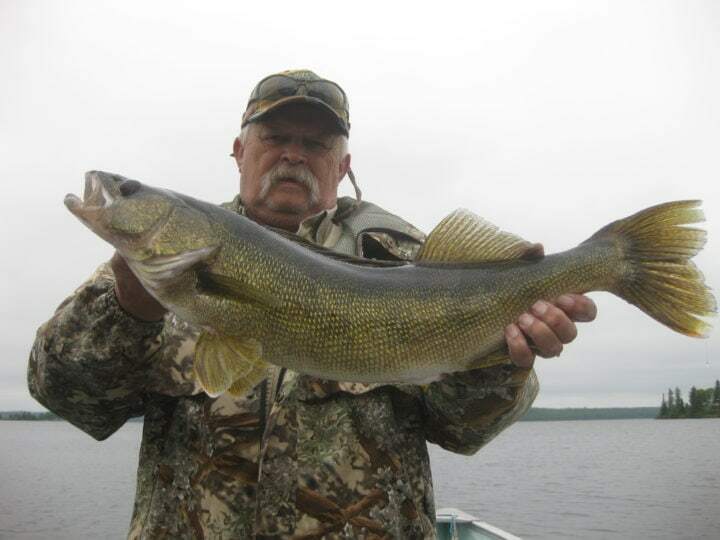 At times, I turn to them for heavy work with big fish when staking or cutting full-length fillet sections from northern pike or big walleye fresh water fish, as well as salt water fish like yellow tail when working from the line to the ice cooler. 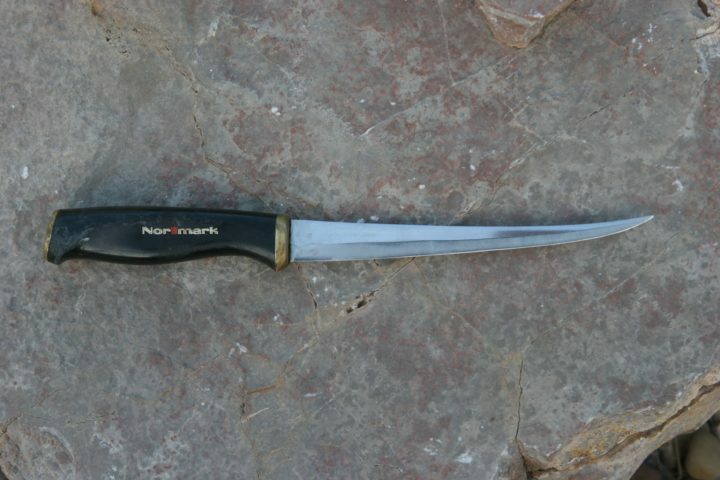 I have three of these types of knives in my kit that go to Canada for week-long game fishing trips. These blades were handmade by an old meat cutter years ago for me. These are stiff blades that don't bend at all but have energy in terms of raw power to cut through large boned fish. The P94823 6” is a commercial-style blade and from what I see here, I like it. 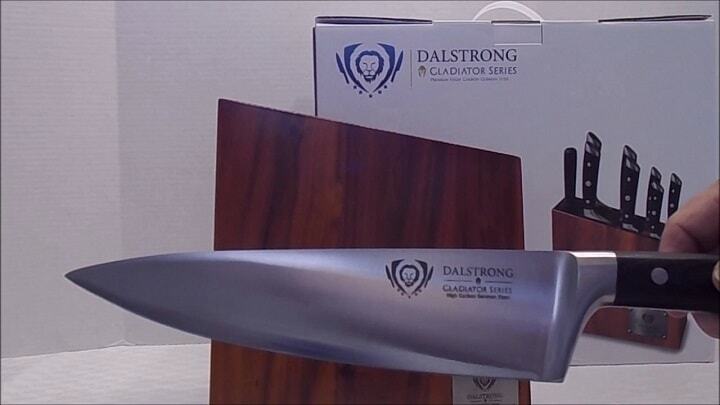 Made with carbon steel versus stainless, it is easy to take a sharpening steel to. A few swipes and you’re back in action at the cleaning table. All my handmade blades are carbon steel versus stainless or even harder metals. Stainless is nice until you need to put a fresh edge on the material. I take a whole box of these stainless-steel knives to a rancher friend with a butcher shop belt sharpening grinder. I cut all of my blades good as new with this commercial system every year just prior to big game season. 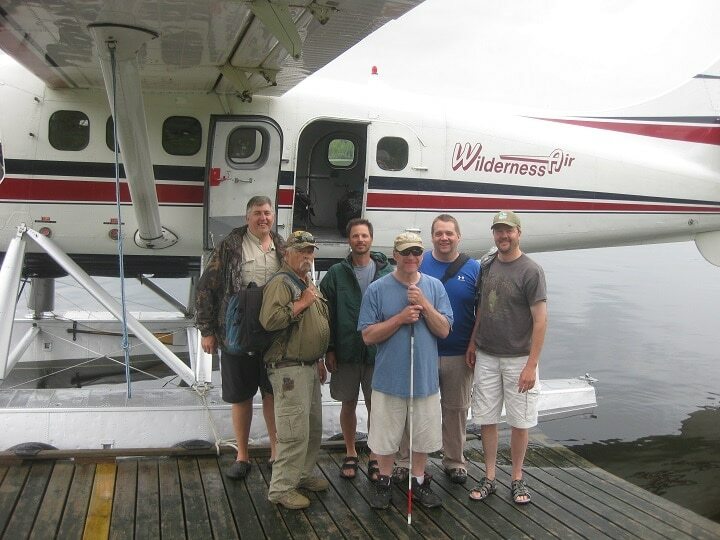 When you load a float plane, you’re not coming back for some time. Fixed blade knives are all that is going along. 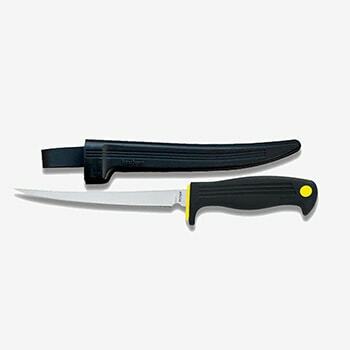 This carbon steel boning knife is a budget tool with the heart of a full-time cutter implement. The price of Dexter Basics varies, so check the latest price at Amazon. The German made HC steel knife retains two different sheaths for storage and carry. The blade is very slim for detailed cutting work and is very nicely made with a full tang high carbon steel blade that is polished to 18 degree per side. The design is an award-winning pattern, and the total package is a premium blade to be sure. 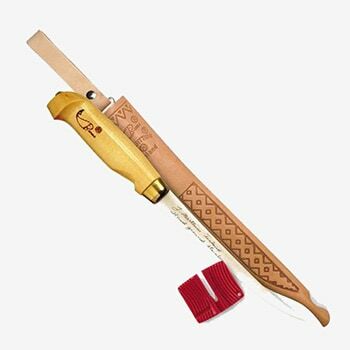 This is a professional chef’s cutting tool. 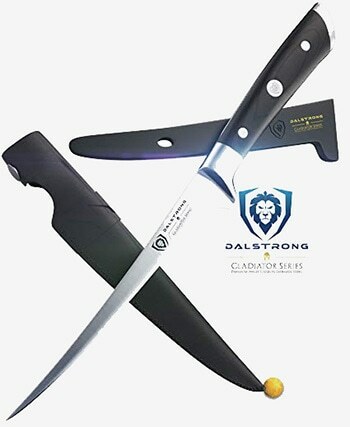 The price of Dalstrong Gladiator varies, so check the latest price at Amazon. I call them power knives and I will be blunt here--I don't use them at all. Most places I fish during fly fishing in Canada are not conducive to any form of power knife. Here in my home state of South Dakota, it is different as the state game and fish agency builds power-supplied cleaning stations for the fishermen at the landing areas on both rivers and lakes. But Big fish require big tools. If you have power or have a whole lot of storage battery power to work with, these knives do a great job. I have been with commercial outfits on the Missouri River during walleye fishing trip that make short work out of a pile of fish in a hurry. A point in fact is that I never did see one of these at work until I came to South Dakota over 19 years ago. Prior to that, I worked as a professional guide in Minnesota and as such, worked standard knives over thousands of fish during some 40 years on the water. 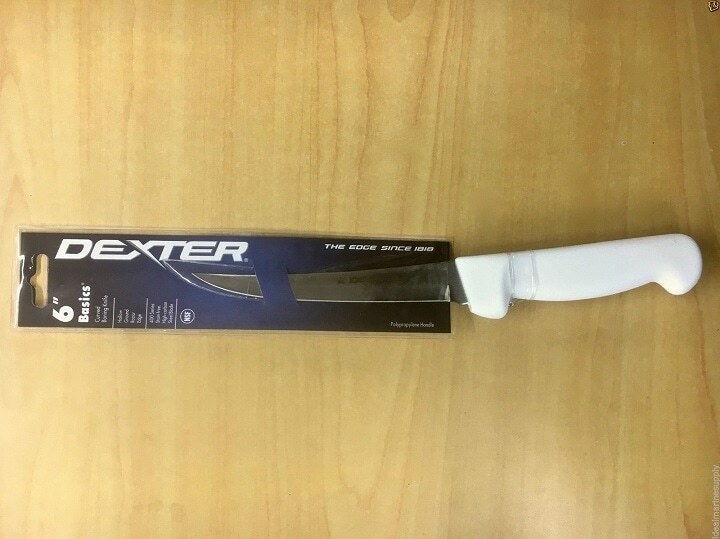 This knife is made of high-quality material and carries a strong, heavy-duty motor and 7 ½ blade that is removable and dishwasher safe. The knife has twice the cutting speed and three times the power of a standard electric knife, according to the manufacture. The price of Rapala Electric Fillet Knife varies, so check the latest price at Amazon. This knife is upper end, but with some added features that allow it to go anyplace that you can locate some recharging power. The knife is a system as such and makes use of several blade options. It has a built-in light for low light working conditions and a heavy-duty carrying case. The price of Waring WEK200 varies, so check the latest price at Amazon. 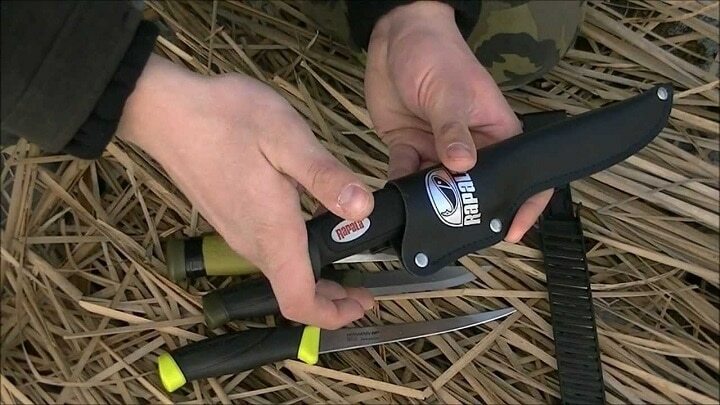 The American Angler PRO is a knife designed just for fishermen. 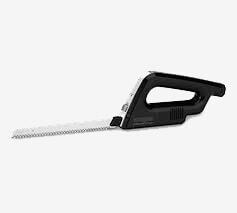 This knife run up 2X more torque than any other “ heavy duty” electric knife. Cooling vents in the grip keep the handle cool even when used for long periods of time. This electric knife has a full two-year limited warranty. The blade is stainless steel, and it is stated that this knife will hold a good edge for a prolonged period of time. The blade length is 8 inches and replacement blades are available for the system. 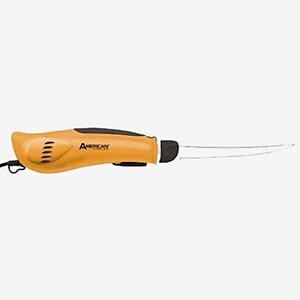 The price of American Angler PRO Knife varies, so check the latest price at Amazon.